If you live in a rainy climate, having a golf rain suit is an indispensable necessity. Many rain suits are bulky, heavy, and difficult to keep in your bag for those unexpected shower emergencies. There is an alternative, though, in the value rain suit category -- what is called "packable" -- just another term for a lightweight, less-expensive option. Nike offers a few options in this category, for both men and women, that cover the gamut of needs for most golfers. Full-blown, "pro-caliber" rain suits can run into the range of $300 - $500 and even more. Nike packable rain suits are a fraction of that price. Nike's offering in this suit category uses a windproof fabric that is designed to keep out the wind and cold. In addition, the fabric uses their Dri-Fit technology to help maintain comfort next to your skin. The suits are cut loosely and provide drape (for good looks) and a full range-of-motion (perhaps most important) during your golf swing, and feature a vented back. With a mock-neck design -- a stand-up collar that zips all the way to the top -- they provide rain protection for your neck as well. Nike uses Velcro-brand fasteners at the cuff which are adjustable, and also twill pull-tabs on the zippered side pockets in the jacket. The pants also feature side-zip pockets, an elastic waist with a draw cord for a comfortable fit, and snap vented hems. 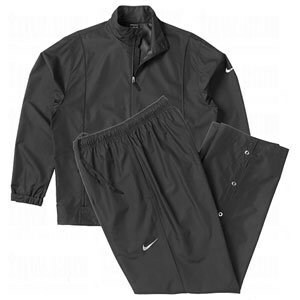 All of the Nike packable rain suits are made from 100% polyester, are machine washable, and can be packed into a small, zippered case that fits easily in your golf bag.